A – It comes from a bankrupt record store. B – Someone stole this and gave it to the store. C – This is so damned bad that no one bothered to open it. Instead of throwing it in the garbage bin. The person felt like recycling this. One man`s garbage could be one man`s treasure. A music philanthropist donated this CD. 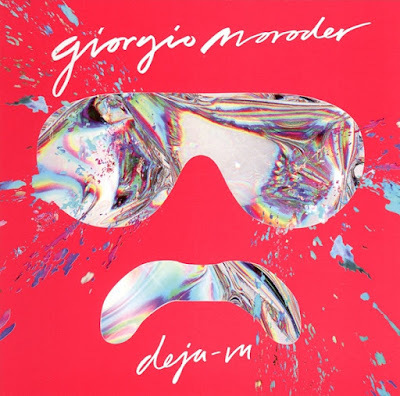 Personally, I remember Giorgio Moroder`s cool electro / ambient / disco soundtrack works: Midnight Express (1978), Battlestar Galactica (1978), American Gigolo (1980), Cat People (1982), Mamba (1988), Fair Game (1988), and Another Way (1988). There`s some guest singers on deja-vu: Sia, Charli XCX, Mikky Ekko, Kylie Minogue, Matthew Koma, Britney Spears, Foxes, Kelis and Marlene. It took me some listening to `appreciate` this album. In life, nothing is totally good or bad. Let`s find the good points and bad points, shall we. Goodies; good choice of singers, top-notch production, excellent electronic / disco / synth-pop / dance music. Badies: generic and commercial. It sounds like your regular, flavor of the day, mass produced electronic dance music. I tried but nothing works for me here. I`ll stick to his old soundtracks.